When Ahsoka Tano walked away from the Jedi Order at the end of the fifth season of The Clone Wars, many of us didn’t expect her to work alongside her former master (or any of the other Jedi) ever again. 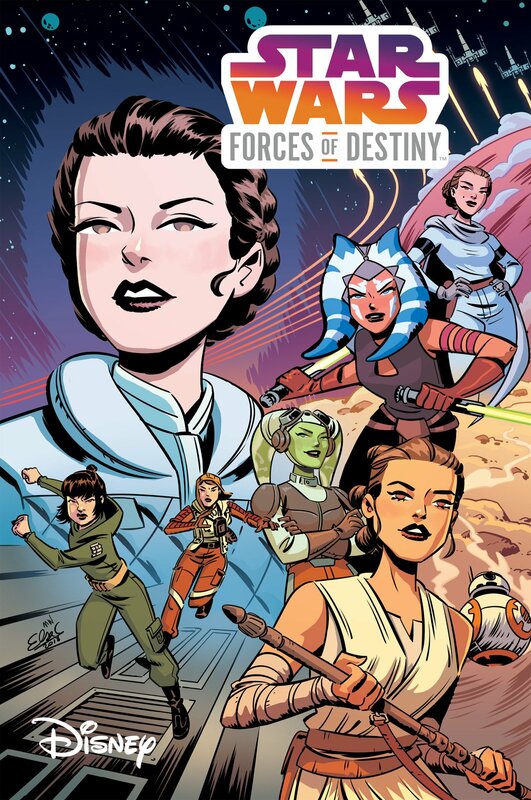 Of course, we now know that she would eventually team up with the Jedi Kanan Jarrus and his Padawan Ezra Bridger in Star Wars Rebels and learnt that she also played an important role in the Siege of Mandalore, an epic battle that was referenced on Rebels and briefly touched upon during last year’s Untold Clone Wars panel. 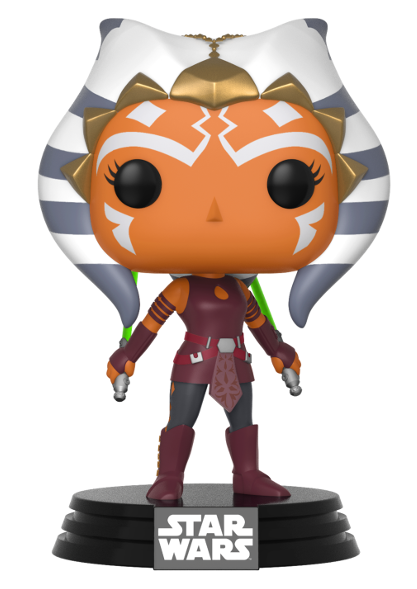 But the Clone Wars production team actually had another story arc in the works that would have seen Ahsoka return from the lower levels to alert the Jedi Council to the actions of some “nefarious entities” operating in the depths of Coruscant, whose scheming would go as far as to endanger Grand Master Yoda. In Part 2 of the Ahsoka’s Untold Tales panel, Dave Filoni (Supervising Director of The Clone Wars and Star Wars Rebels) and Pablo Hidalgo (Lucasfilm Story Group) talked about Ahsoka’s new life in the Coruscant underworld and how her strong moral centre presented some challenges in adapting to her new surroundings. 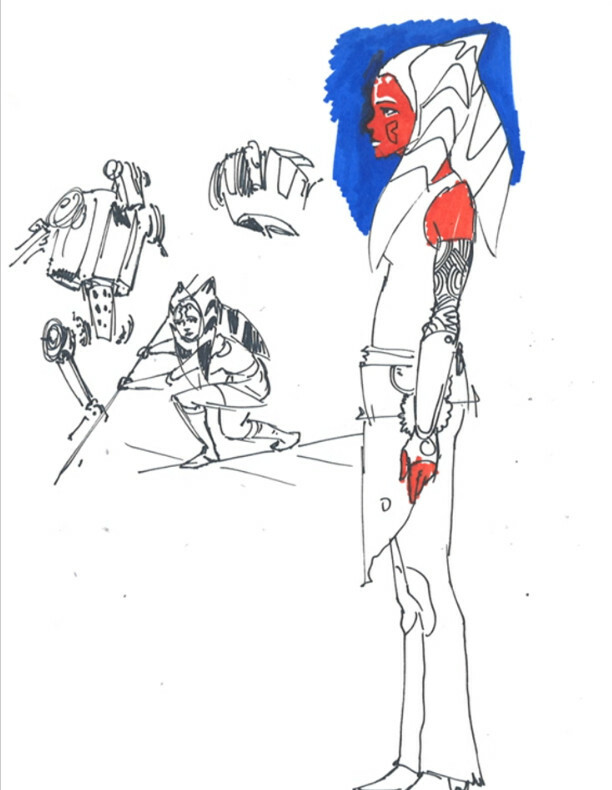 As they began discussing the next story arc they had planned for her, Hidalgo pointed out that even though Ahsoka was trying to carve out a new life for herself, she can’t change who she is and so becomes a kind of underworld vigilante, helping those who can’t help themselves. This reinforces the notion once again that while Ahsoka no longer considers herself a Jedi, she still holds many of their ideals close to her heart. 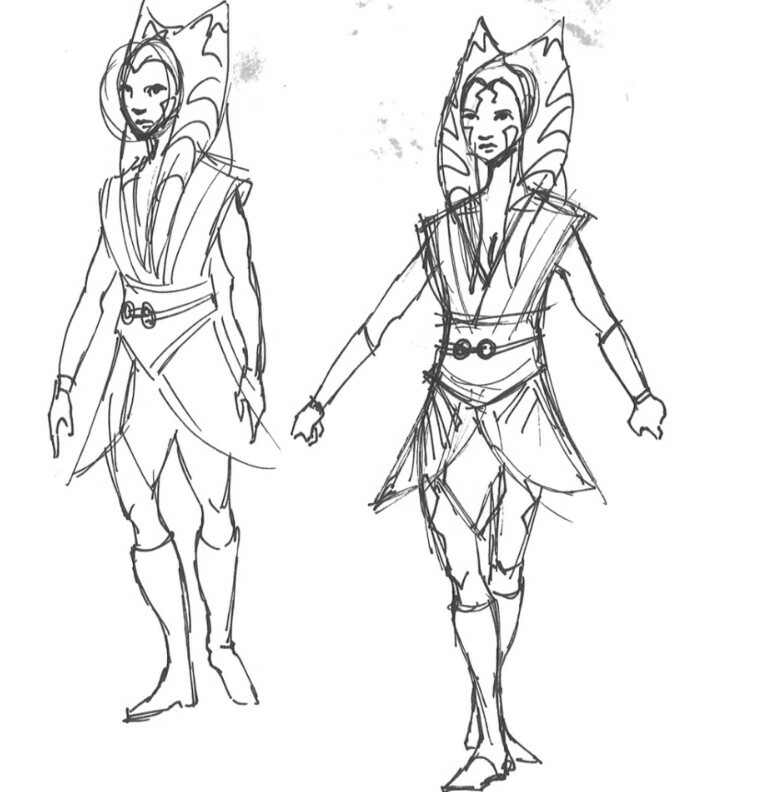 And what is a new story arc without a few new costume designs for Ahsoka? 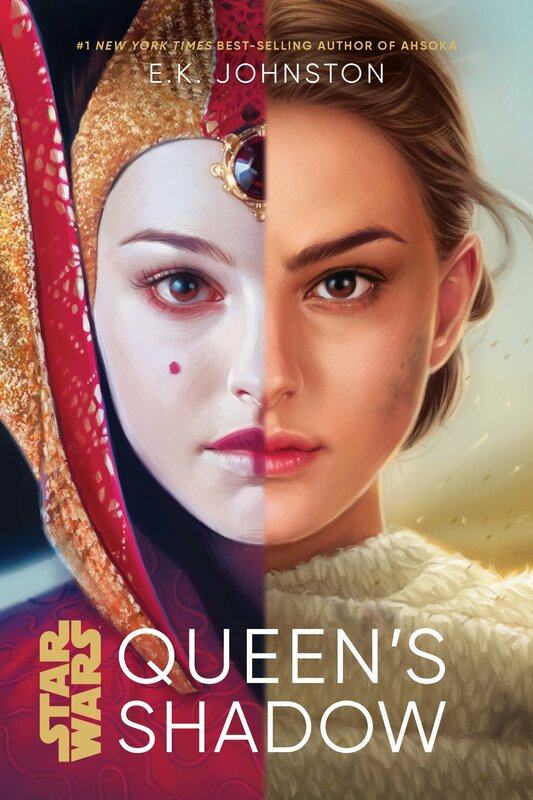 “Sorry to develop new costumes again”, Filoni said somewhat apologetically, “I was actually trying to do something that was in some ways reminiscent of Ventress, also reminiscent of the Sister (or Daughter) on Mortis. There were certain elements that she was playing with in her costume”. 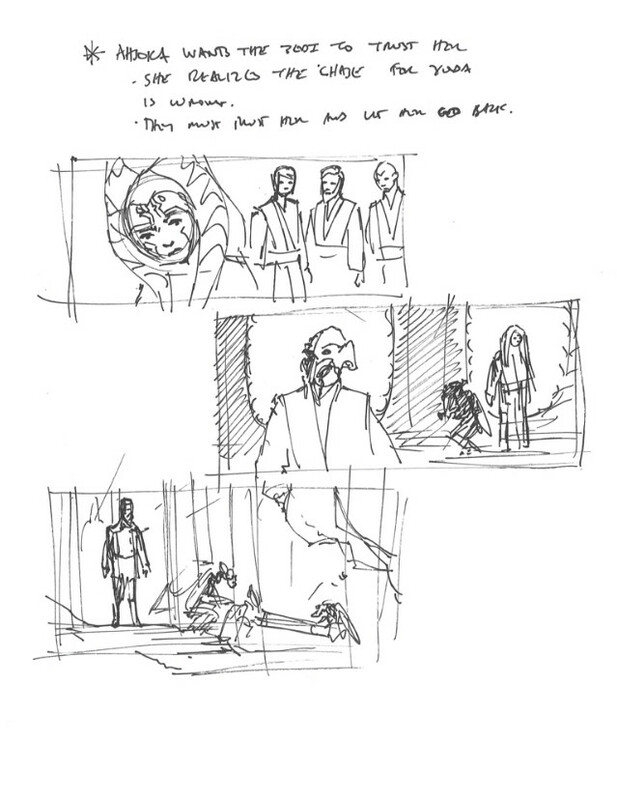 Filoni explained that he’d normally sketch these doodles during his meetings with George Lucas and the writers. “I would do these when George and I were talking about the stories. So I would sit and be drawing the whole time”. 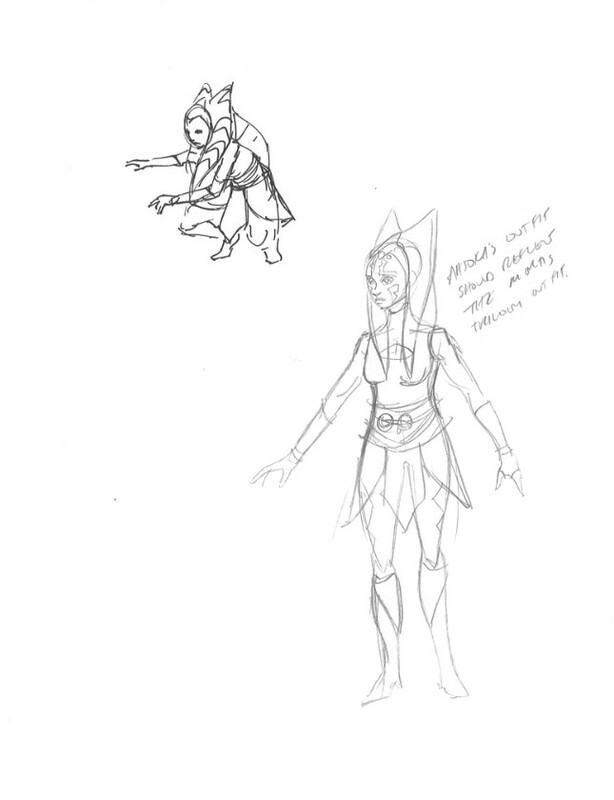 While we never got to see the final version of this costume, Filoni held onto certain elements and later incorporated them into Ahsoka’s Rebels outfit. “You can see on the skirt element, she’s got a three-panel thing going on. And I actually kept that, with that type of belt pretty much, in Rebels“. Coming back to the story arc itself, Hidalgo explained that this would have been the arc where we would have found out that an ancient Sith temple lay deep beneath the planet’s surface, miles beneath the Jedi Temple. 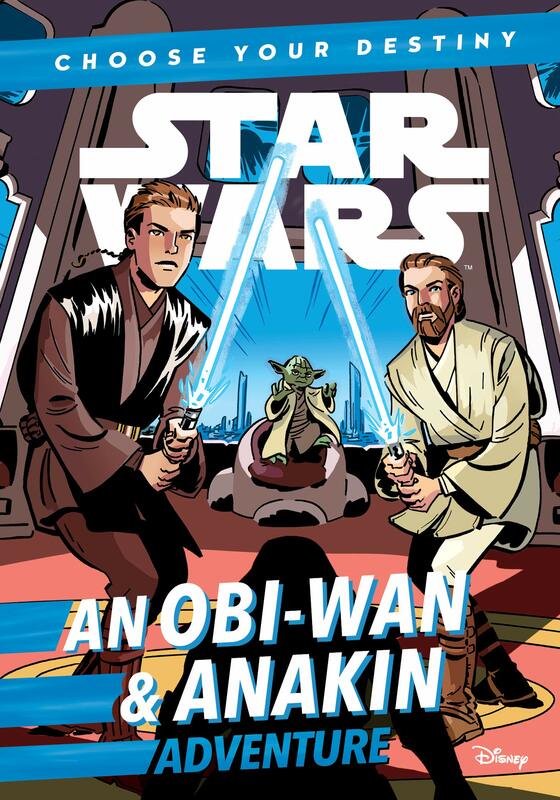 While this storyline was never completed thanks to the show’s cancellation, the concept of a Sith shrine buried beneath the Jedi Temple was kept alive and made canon in the 2014 James Luceno novel, Tarkin. In the book, we discover that Palpatine had learnt how to exploit the residual Dark Side energy contained within the long-forgotten shrine to mask his true identity from the Jedi Council, cloud their vision, and ultimately destroy the Order. 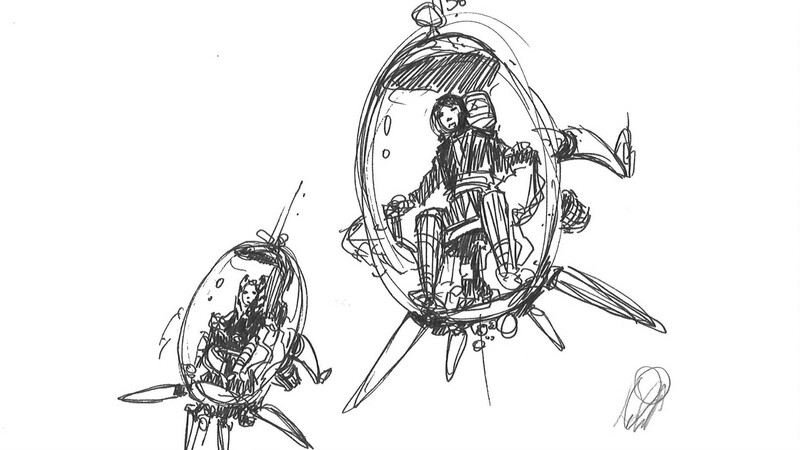 In the planned story arc, we would have seen Ahsoka join the Jedi in their search for the aforementioned “nefarious entities” and seen her and Anakin use some pretty funky-looking exploration vehicles to reach the ruins of the Sith temple deep down on Level 1 (which is deemed uninhabitable). The notion that the Jedi would build their temple upon the ruins of an ancient Sith site has parallels in the real world. As Filoni points out, “A lot of churches are actually built on ancient pagan sites” and that by building their temple over the ruins of a sacred Sith site centuries ago, the Jedi Order had hoped to demonstrate their victory over the Dark Side. 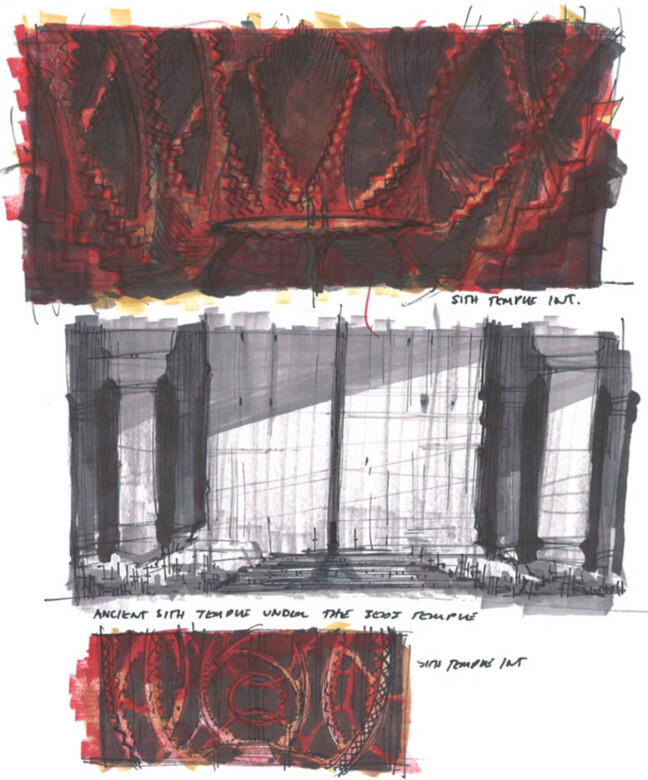 Hidalgo and Filoni went on to share some concept art for the Sith temple, which naturally shares the eye-catching black-and-red colour scheme of its counterpart on Malachor. Huge, towering pillars can be seen holding up the temple’s ceiling and, like the Sith temple on Malachor, this sacred site housed a giant infernal machine within its inner sanctum. This machine would have contained large moving gears…and it would have been as impressive as the animation budget allowed. The next slide showed a sketch of what would have been part of an intense (but thankfully short) confrontation between Ahsoka and Darth Sidious. 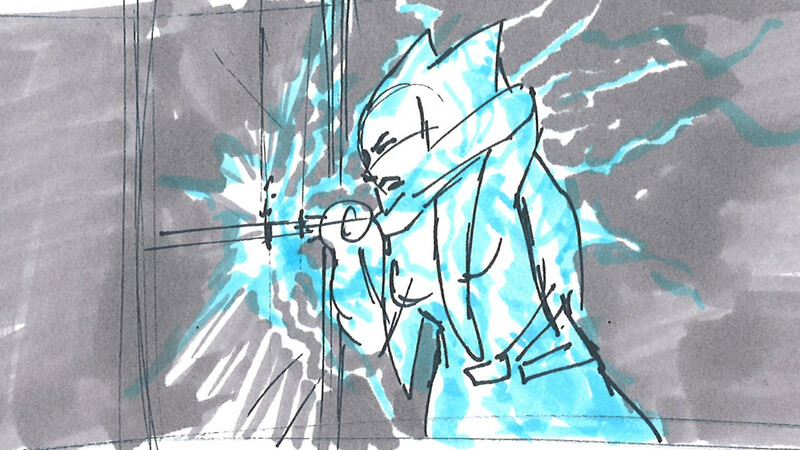 “This was a moment where Ahsoka was actually protecting the holocron vault by impaling her lightsaber in the doorway to melt it shut”, Filoni explained. “And Sidious was actually on the other side of this big door, sending Force lightning up her lightsaber blade and out the other side to attack her. So that was as close a confrontation between the two of them as we got”. “They never got face to face”, Hidalgo added. “There was always this barrier between them. But you saw a battle going on”. This revelation provoked a surprised “What? !” from Ashley Eckstein (voice of Ahsoka Tano) but Filoni quickly stepped in to assure her that Ahsoka wouldn’t have wanted to fight Sidious face to face as she probably would have lost that battle. “The door is good for you”, he joked. Before moving on to the next part of the panel, “The Siege of Mandalore”, Hidalgo and Filoni added a few final comments about the story arc they had just discussed. 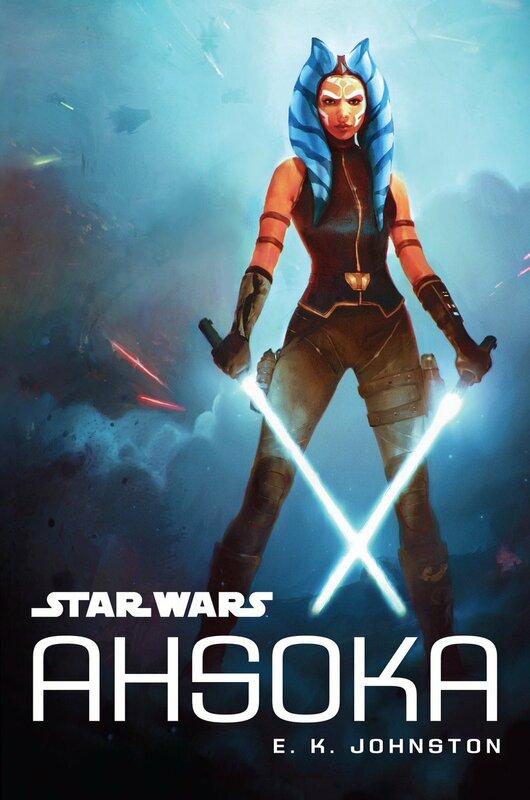 “The whole purpose of that particular arc”, Hidalgo explained, “was to bring Ahsoka back. She’s not a Jedi, she doesn’t change her decision, but she gets involved in Jedi business again. The war is still going on and she’s a responsible person, so she’s not someone who’s going to run away from her responsibilities”. “She has a lack of trust with the political aspect of the Jedi”, Filoni added. “What Barriss says sinks in and there’s a lot of truth to what Barriss says. But she still trusts Anakin and she trusts Obi-Wan, so she does have people she believes in, that she wants to help, in this galactic time of crisis”. 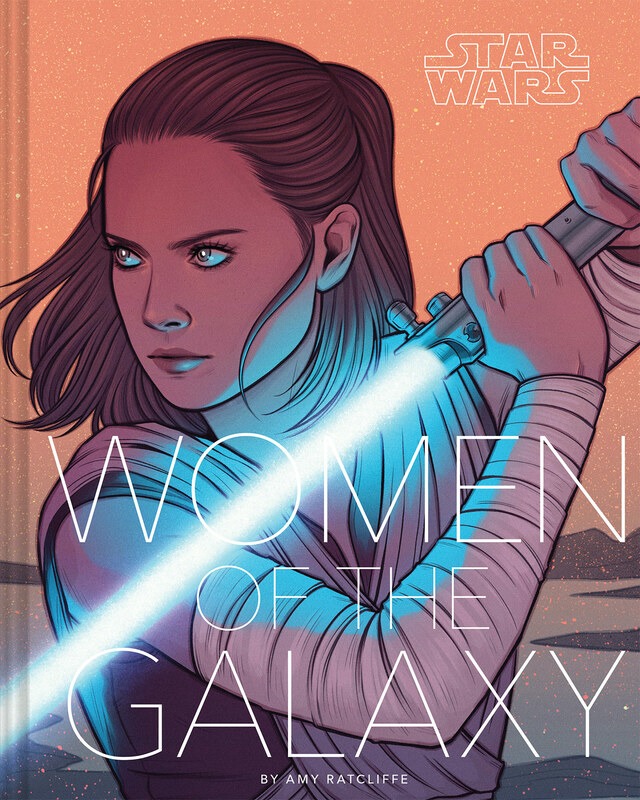 This article is the third in a series of articles on the “Ahsoka’s Untold Tales” panel from Star Wars Celebration Europe. In the next installment, we’ll be looking at the much-talked about Siege of Mandalore and how this epic battle would have tied The Clone Wars and Revenge of the Sith together.